Ecologically Sustainable Development (ESD) - from mechanistic to organic. 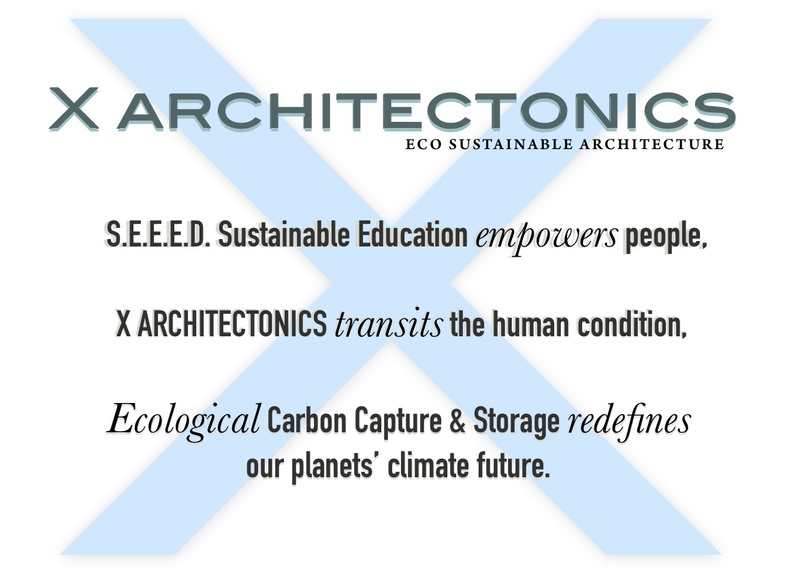 X Architectonics promotes the Eco Sustainable S.E.E.E.D. Cycle - from the earth and back to the earth. X Architectonics is based on ecological sustainability and time proven methodologies that defines a new era in architecture: Ecologically Sustainable Architecture. 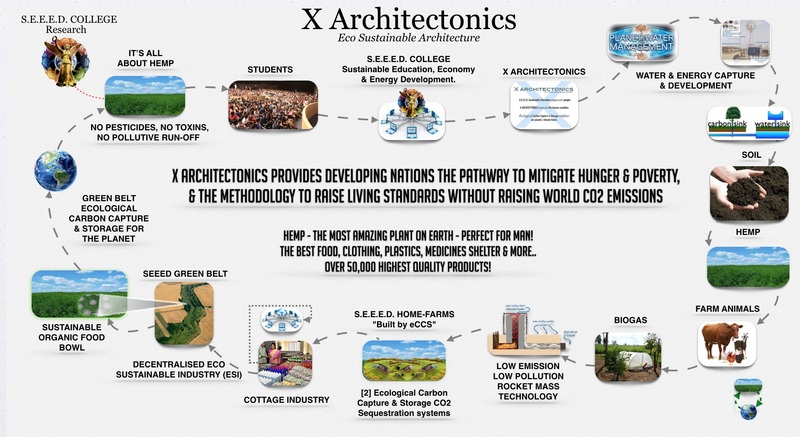 "X" depicts the turning point, the definitive axis of change - when Architecture transits from pollute practices to Ecologically Sustainable Development (ESD) - from mechanistic to organic. All eco sustainable S.E.E.E.D. Home-Farms are built from the organism up, literally. Soil is the basis for all life and healthy microbial activity is what drives the plants that X Architectonics builds upon. Everything comes from the earth. Seeds become plants into products which will eventually return back to the earth to enrich the soil - The Eco Sustainable S.E.E.E.D. Cycle. When no pesticides or artificial fertilisers are employed, the natural cycle of plant materials and products throughout their lifecycle provide minimal environmental impact. Environmental impact is decreased through waste minimisation. Low energy methods in manufacturing of plant products can be supplied by manual labour, wind and solar. Tractors and heavy farming machinery can be run on ethanol, a product of hemp plants. The sustainable cycle is achieved since proportions of waste can be reused, recycled or safely buried back in the earth. Establishing SEEED Green Belts in Africa includes a strong business incentive delivering organic food to Europe. It is hoped this incentive may curb the African to re-think "catching the boat" by providing choice. X Architectonics will give an alternative future, one of hope to Africans in their own country. Soil Carbon Sequestration (SCS) sequesters and stores atmospheric CO2 directly in the soil and ecological Carbon Capture & Storage (eCCS) sequesters and stores atmospheric CO2 into eCCS Block (hempcrete). The pre-fab building blocks of home-farms, with fast and easy construction. Altogether they form a SEEED Green Belt in a continuous array of CO2 sinks that will act to bio-sequester and safely store atmospheric CO2. A SEEED Home-Farm produces food based upon Permaculture and small-scale, subsistence-oriented agriculture based on cottage industry family labour. Access to internet and material resources will enable a fair playing field to develop business systems and become productive citizens. Coal-fired Power Stations continue to trial and capture their own CO2 emissions. It's called Carbon Capture & Storage (CCS) and then bury it deep underground, and with some success. But the process is not widely available as the right geological underground caverns are limited. Ecological Carbon Capture & Storage (eCCS) uses natural organic material (Hemp Shiv) to sequester atmospheric CO2 and binds with a mineral (Lime) to become Hempcrete, and over time sequesters more CO2 into rock, locking in the CO2. eCCS Block (known as hempcrete) and Soil Carbon Sequestration (SCS) are true eco safe CO2 sequestering technologies. Soil is the perfect CO2 sink the Climate Change world is searching for. Man has depleted CO2 from the soil and man can restore soil to its' formerly rich state. We also have an epidemic of unhealthy people... and we have the lowest nutrient soil in history. Soil is presently "CO2 starved" - the vital link in mitigating climate change - and a vital link in human health. Practicing bio-sequestration techniques restores microbial health - which in turn sequesters atmospheric CO2 - which then improves human health through more nutritious food. SEEED Home-Farms will provide water, food, clothing, energy and shelter with jobs with a zero net carbon footprint. SEEED Home-Farms form a decentralized Eco Sustainable Industry providing employment and business incentives. A SEEED Village will house people interested in ESI, Permaculture and Aquaponic gardens willing to play a part in a vital net zero positive initiative. A well insulated SEEED Home-Farm reduces energy consumption by 90%. When the sun doesn't shine, Rocket Mass Technologies deliver warmth and heat for cooking with minimal CO2 output and extremely low emissions. Ecological Carbon Capture & Storage (eCCS) sequesters CO2 into stabilised and fire proof "breathing" hempcrete insulation building materials. eCCS and SCS cover the entire land area maximizing atmospheric CO2 sequestration. Both eCCS and SCS deliver permanent removal and secure storage of carbon dioxide from the atmosphere. All steps and processes are non-toxic and non-polluting.